Two alternative preliminary site plans have been prepared; one works around wetlands limitations, while the other assumes filling of some wetlands and creation of compensating wetland areas. The first plan includes a total parcel area of 194.8 acres with parcels ranging from 16.6 to 47.2 acres. Total developable area is 172 acres. The second option shows a total of 224.8 acres with parcels ranging from 16.6 to 56.2 acres. The total developable area is 200.3 acres. 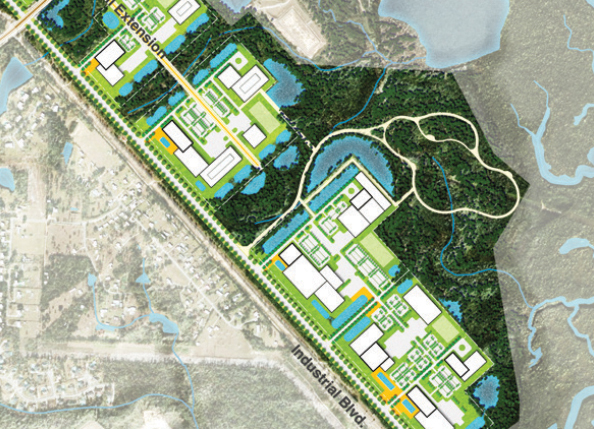 Under both development scenarios, three of the parcel areas can have rail service; replacement of the wetlands allows the largest rail served site to increase from 47.2 acres to 50.2 acres. Both site plans show 6 parcel areas.